Whether you are new to "stacking and whacking," or trying it again, this is the method I now recommend. 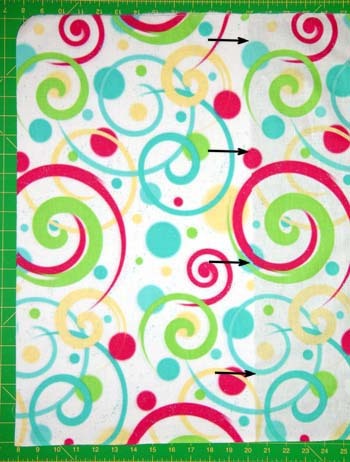 Download the "Stack-n-Whack® Basics" PDF, a printable version of these cutting instructions and the pinning instructions. This approach to finding the repeats saves your eyes from those pesky little 1/8" marks on the ruler. It also avoids the common tendency to cut the first layer more than one repeat long. Begin by tearing the fabric on the fold, or at the width directed in the pattern you're making. 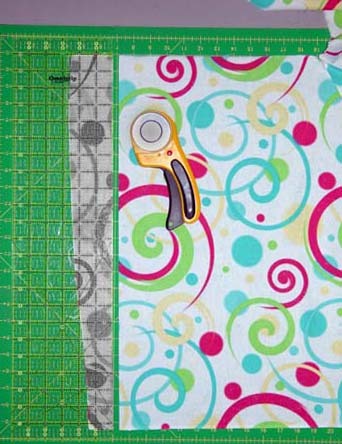 Lay out a single layer of fabric on the cutting mat. Square up the end of the fabric, trimming at least 1" at the skinniest part. Save the trimmed-off strip. This is your ARF (Amazing Repeat Finder)! It's shaded in the photos below to make it easier to see. 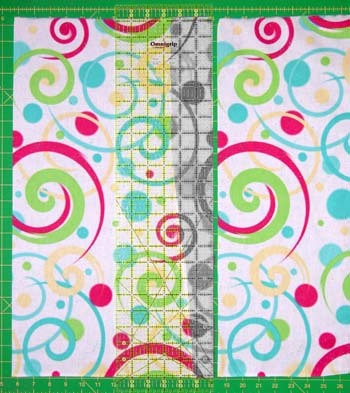 Move the ARF along the fabric just until the print matches on both sides of the fabric strip. The edge of the strip closest to the rest of the fabric (on the right in the photo below, marked with arrows) marks one repeat. Measure from the trimmed edge of the fabric to the opposite edge of the strip (the edge closest to the rest of the fabric) to find the approximate design repeat length. In the photo below, the repeat measures a little over 12". Check this measurement against the Stack-n-Whack® chart for your pattern to see if you will need more than one repeat for each layer. If so, move the strip up to the second (or third) place where the repeat matches. 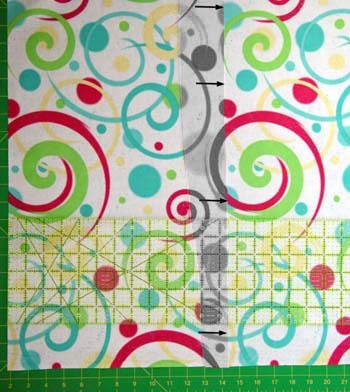 Lay a ruler over the ARF and cut along the edge that is closest to the remaining fabric, as shown below. You have now cut the first layer of your stack. Lay the first layer on the remaining fabric, matching the edge closest to the remaining fabric. (Don't worry about matching up the two cut edges on the other end exactly.) Cut along the edge (shown by the arrows, below) to make the second layer. Set this layer aside, and continue cutting layers as needed, using the first layer as a guide.